The 8th generation is already benefiting from an aura of recognition by marine professionals and by the public. In just a few months, Jeanneau has earned an array of awards! On the heels of two successful sailboat models launched last year, the SUN ODYSSEY 440 and SUN ODYSSEY 490, the line is now expanding to include a third model: the SUN ODYSSEY 410. This newest addition is designed by Marc Lombard, a longstanding design partner who draws much of his inspiration from race boats. This model will be unveiled at the upcoming autumn shows! the new NC 37 is open to the exterior. This model is faithful to the spirit of the line, designed for comfortable, easy cruising. the new LEADER 30 Hors-Bord, designed for coastal cruising. the new LEADER 33 Hors-Bord, a sporty look & on-trend style of luxurious outboard models with its sport top and continuous windows in the hull. 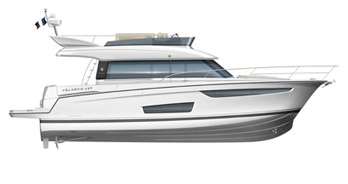 the new CAP CAMARAT 6.5 WA SÉRIE3, the highly successful Walk-Around line will also grow to include a 6-metre model. the new CAP CAMARAT 6.5 CC SÉRIE3 A sporty, family boat by nature, featuring a particularly comfortable ergonomic cockpit design. the new CAP CAMARAT 9.0 CC, new day boat boasting a very elegant design who can accommodate up to 11 people on board. The spirit of the Merry Fisher will take on a multi-use dimension with the launch of the MERRY FISHER 605 MARLIN, and a surprise for the end of the year! Winds of change are blowing on VELASCO 37 F et VELASCO 43 F who enter in a new era in terms of interior layouts, to be ever more welcoming, inviting and enjoyable!